The organ is based on late 17th century English chamber organs, particularly the organ at Compton Wynyates in Warwickshire, which was used as a basis for the appearance, the sound, and much of the mechanism. The main departures from the original are the use of an Open Diapason instead of Stopped, suspended action, the pedalboard and the regal. The pipes for the two sets of keys stand on the same small chest, which means double pallets, and the Open Diapason is available on both, which means non-return valves. The divided stops also complicate the layout of the chest. The stability of the organ undoubtedly benefits from the environment of Los Angeles, where the organ now lives with Anita Hanawalt, giving an extra dimension to her teaching at La Verne University. The Open Diapason and Principal are made of pine. The Twelfth and Fifteenth are metal principals, the Stopped Flute is metal, and the Recorder is an open metal flute. These are all copies of examples found at Compton Wynyates and other late 17th century chamber organs. 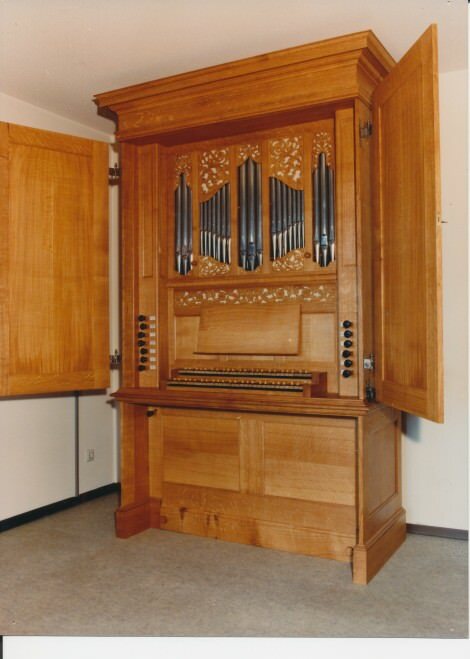 The Regal is based on an early 17th century South German example in the Brussels Musical Instrument Museum. The compass is C – f³ (divided b/c¹), and C – d¹ for the pedals. The metal pipes are cone tuned. The pitch is a¹=415Hz and the tuning is a slightly modified meantone with good thirds.